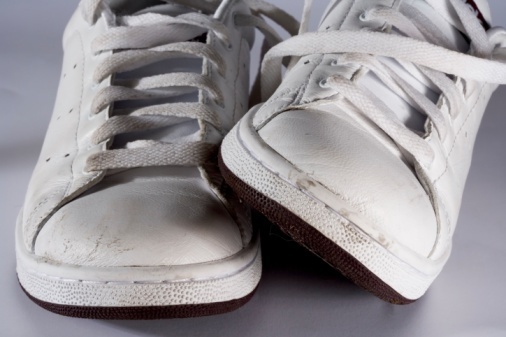 Wash sneakers is very simple, but needs to take certain precautions, otherwise the shoes can spoil. Not necessary to wash them by hand, better to do it in the washing machine. Of course, not every shoes are able to move the Laundry so if you are in doubt of its quality - do not experiment. Before washing the shoes, you need to prepare. If sneakers hanging dirt, first wash it under running water. Remove the laces, they need to be washed separately, since they can fall iron tips. But insoles can get, and you might want to keep in sneakers. Put shoes in the washing machine. Best running shoes put in a special bag for washing things, but if you don't have one, use a regular old pillowcase. Also put unnecessary rags, they will soften the blow of the sneaker on the drum. For washing shoes it is advisable to use liquid detergents, they are gentler effect on the material, and the color remains bright much longer. Add in the compartment for the main wash desired amount of powder and turn on the "delicate wash". Use conditioner when washing shoes is not necessary. As soon as the sneakers gonna do, fill them with unnecessary paper. This will reduce the risk of deformation of the Shoe during drying. Do not forget to change the newspaper as it gets wet. When shoes are almost dry, remove the gasket from the inside. If you have on sneakers feature leather panels, treat them colorless cream to add Shine. Pass the laces and can begin to wear a familiar and comfortable shoes. If you decided not to wash shoes in the washing machine, do it manually. Pour in a basin of warm water and soak the sneakers, let them soak a bit. Start the wash. To do this, use a small sponge and any liquid detergent. Thoroughly wash the sole and inner part of the Shoe. Rinse the shoes in clean water. Shoes gently press out the excess water. Drying produce above way. Russian savvy the most amazing. Original answer written in the Soviet encyclopedia of the household. Free sneakers laces. Visually identify the most dirty areas. Take a lace with one Shoe and a fairly tight wrap on the palm across the fingers. Squeeze your hand into a fist. Abundant lather the wound cord on the species, rear and end sides. Take the opposite hand to your toothbrush and begin intensively to pass on the lace. The main convenience of this method is that you can compress and decompress the wrist for a more thorough washing of laces. Repeat the procedure with the lace from the other Shoe. Some laces can ruin the washing machine. They can easily fall into the hole of the drum and to break some of the mechanisms. This hand wash method more convenient than the traditional one. Moreover, if you are right handed and will use left hand for washing, it will help you to develop other (not dominant) hemisphere of the brain.